Sony's Blu-ray DVD technology has won over another heavyweight supporter in the battle to be Hollywood's format of choice for the next generation of DVDs. 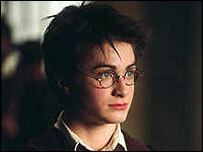 Film studio Warner Bros has said it will release DVDs in the Blu-ray as well as Toshiba-backed HD DVD formats. For months, Toshiba and Sony have been leading the charge to woo hi-tech firms and studios to support rival formats. But the film and technology industries want to avoid a war akin to the 1980s Betamax and VHS video format battle. Last month, computer giants Intel and Microsoft opted to back HD DVD technology. Other computing giants, such as Dell and Apple, support the Blu-ray format. Some technology firms and studios have remained open to both formats because there has so far been no compromise made in a unified technology. Warner Bros' move follows Paramount Home Entertainment's decision this month to support both formats. The next generation of DVDs will be able to store much more high-quality data, especially important for high-definition video. For Hollywood, dependable DVD technology that has fast and cheap production times is key. But the film and technology industries both want to make sure people buying the next generation of high-definition DVDs are not confused about what discs work in which types of players. Bob Chapek, president of Buena Vista Home Entertainment, a backer of Blu-ray, said the move by Warner Bros showed the strength of the Sony-led technology. "The continued dramatic momentum towards Blu-ray makes us more optimistic than ever that a format war can be avoided," he said. Mike Dunn, president of Twentieth Century Fox Home Entertainment, which also supports Blu-ray, added: "The real winner in all of this will be the consumer as a single format comes to market with the dominant support of both the hardware and software industries." 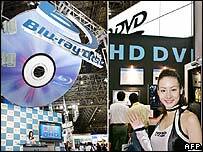 Analysts Forrester Research this week also predicted that the Blu-ray format would come out top in the format war because of growing support for the technology. Earlier this week, Hewlett-Packard said it had asked the BDA to ensure Blu-ray included specific technological compatibilities which are important to PC makers. HD DVD already carries the required specifications. Toshiba's first laptop with a next-generation HD DVD drive will be launched early next year in Japan.